One of the cornerstones of the primary prevention of CVDs has been screening for high BP and anti-hypertensive drug treatment. The benefits of anti-hypertensive drug therapy for older persons have been clearly established. Prior studies have shown that anti-hypertensive drug treatment for older hypertensive persons confers highly significant and clinically relevant reductions in cardiovascular morbidity and mortality rates. Nevertheless, a considerable percentage of older persons with hypertension are not detected or are not adequately treated for hypertension. Measures should be taken to diagnose hypertension and prevent or postpone its complications in this age group as the burden of hypertension is bound to increase due to increasing life expectancy rates. Health seeking behavior of the elderly is influenced by their economic instability, reduced physical endurance, social isolation, reduced cognitive ability, dependency, and loneliness. This makes them more vulnerable to suffer or succumb to illnesses, which may be treatable, or whose disabling effects could be postponed. The current study was carried out to document the prevalence of hypertension, to understand the health seeking behavior and expenditure on treatment in the elder population of rural Puducherry in South India. The study was reviewed and approved by the Institute Ethics Committee of Indira Gandhi Medical College and Research Institute. Participant information sheet was provided and informed written consent was elicited in local language. A community-based cross-sectional study was carried out in rural field practice area of the Department of Community Medicine of Indira Gandhi Medical College and Research Institute. The study area is located in Union Territory of Puducherry, South India. Total population under field practice area was about 26,000 as on March 2011. One primary health center with five sub-centers provides health services in the field practice area. One of the sub-centers, serving a population of 7400, was selected randomly by lots for the study. The study area mainly comprised of rural population with agriculture and agriculture-related works as the main occupation. Elderly persons (age 60 years and above) residing in the study area for at least 6 months were included in the study. Elderly individuals who were critically ill and unable to comprehend questions were excluded. Based on a prevalence of 55% in Kerala, (a neighboring state in south India), among elderly from reviewed literature,  assuming an absolute precision of 7% and α error 5%, the required sample size came out to be about 202. A sample size of about 220 was decided in order to adjust for non-response. A pretested, structured interview schedule was used to collect data on demographic characteristics, health seeking behavior and expenditure on treatment for hypertension (in previously diagnosed cases). The list of houses where elderly individuals were available was taken from the census conducted by the field level health workers in December 2010. These houses constituted the sampling frame. Systematic random sampling method was employed to select the houses. If more than one eligible was present in a selected house, one of them was selected randomly by lottery method. BP measurement was done as per the standard guidelines, i.e. using mercury sphygmomanometer in right arm in the sitting position with feet kept firmly on ground and arm kept at the level of the heart. BP was measured on two separate occasions with a minimum interval of at least 5 minutes between the two measurements. Care was taken on the day of measurement that the participants did not smoke or take caffeine half an hour before the measurement of BP. BP measurements were not done for participants with any acute painful condition like dental pain or joint pain. BP was measured in subsequent visits. Expenditure on treatment for hypertension was self-reported and calculated based on the money spent on consultation with a private practitioner and that spent on purchasing anti-hypertensive medications outside the government health system. Data were entered in Microsoft Excel spreadsheet. Descriptive statistics like mean, median and proportions were calculated using Statistical Package for the Social Sciences (SPSS) version 13.0. About 95% confidence intervals were calculated for proportions. A total of 211 elderly individuals were included in the study. Nine elderly were not included in the study as they were difficult to trace or houses were locked on two successive visits. 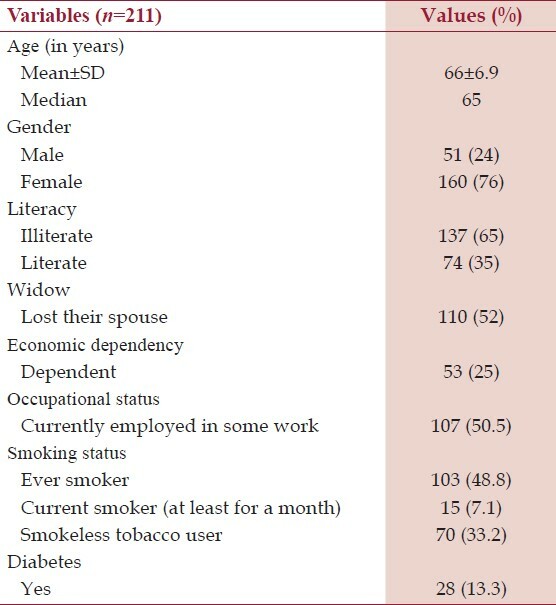 Mean age of study participants was 66 years (SD ±6.9) [Table 1]. About three-fourths (76%) of study subjects were females. About 65% of the participants were illiterate and 25% had completed primary education. More than half of the elderly (52.4%) had lost their spouse. About one-fifth of study subjects (21%) were living alone. One-fourth of subjects (25%) were economically dependent on other family members. Nearly half (49.5%) of the elderly were not engaged in any occupation during the study period while one-third (33%) were engaged in agriculture and agriculture-related works. Around half (51%) of participants never used tobacco in their life time. Seven percent were 'current smokers' (smoking at least for a month) and 33% were 'current smokeless tobacco users'. Thirteen percent (28 out of 211) of the participants reported that they were taking treatment for diabetes mellitus. Breathing problems, joint pains, and sleeplessness were the other complaints among the study population. Mean systolic BP and diastolic pressure in the study participants was 136.9 ± 18.6 mm Hg and 88.1 ± 11.2 mm Hg respectively. The overall prevalence of hypertension among study participants was 40.5% (95% CI: 33.7-47.4%). Prevalence of hypertension among male subjects was 39.2% (95% CI: 25.8-53.8%) whereas it was 40.8% (95% CI: 33.1-48.9%) among female subjects. About 62% (53 out of 85 hypertensives) were already aware of their hypertensive status. Of previously diagnosed hypertensives (n=53) 98% were on treatment. Of those under treatment (n=52), 86.5% were uncontrolled. Among the previously diagnosed cases of hypertension, 54.7% (n=29) were diagnosed at government health facilities either at primary health centers or a government hospital whereas 45.3% (n=24) were diagnosed by private providers. About 81.1% (n=43) of diagnosed cases of hypertension had 'giddiness' or 'fainting' for which they sought care and were subsequently diagnosed as hypertensives. About 65.9% were taking their anti-hypertensive medications from primary health centers and 32% were taking their medications from chemist shops. On an average, the elderly hypertensives were visiting the doctor once in a month (Mean±SD: 27.1 ± 19.2 days). Seventy-five percent of the hypertensives had their BP checked once in 20 days on an average. Forty-eight percent reported that they had missed at least one dose of anti-hypertensives in the last 3-month period. Fifteen percent had reported that they skipped anti-hypertensives for a week and more. 'Went to relative's home' and 'forgot to take medicine' were the commonly told reasons for poor adherence to medication. About 33.3% reported that they had made changes in their diet pattern, like reduction in the consumption of oily foods and reduced salt intake after the diagnosis. When asked about the expected duration of treatment for hypertension, 92.6% of the elderly hypertensives reported that medications have to be continued for life time. About 82.7% of the elderly were satisfied with their treatment. Expenditure on treatment of hypertension was calculated for the previously diagnosed cases that were on treatment. Mean expenditure on consultation came out to be 77 (Indian rupees) (SD ±34.6 ) per visit and for anti-hypertensive medications was 290 per month (SD ±183.7 ). Our findings provide an evidence of high burden of hypertension in the elderly age group in a rural area of Puducherry. The prevalence of hypertension in our study was similar to a study done in rural areas of Kerala. The prevalence reported by Kalavathy et al. was 45%. Our study findings were also similar to a study done in the elderly in rural and urban areas of Puducherry, South India where they reported a prevalence of 43.9% in rural elderly population. However, other studies done in Assam, north-eastern India  and a multi-centric study in Bangladesh and India  had reported higher prevalence of hypertension. However, a study in rural part of Karnataka reported prevalence of hypertension among 60-69 years population to be about 30.5% and 32% in above 70 years population. Moreover, a study done in Kolkata, eastern India among the elderly in urban areas reported prevalence of 53.5%. The difference in prevalence levels may be due to different geographical factors and may be due to differences in dietary pattern. Though 65% of the study participants were illiterate, 62% of all who were found to be hypertensive were already ware of their hypertensive status. This finding reflects the better health seeking behavior and well performing health system (both public and private) in this part of country. Proximity of the study area to the primary health center (PHC) and availability of 24 × 7 services in the PHC might have contributed toward better health seeking behavior. In the study by Kalavathy et al. in Kerala, only 35% were aware of their hypertensive status. About half of hypertensives had been diagnosed by private practitioners. This finding shows the preference toward private practitioners and that the elderly were spending money from their pocket for diagnosis and as well as treatment of hypertension. Awareness has to be created that diagnosis and treatment of hypertension are carried out routinely in the PHCs. Barriers for geriatric care at PHCs have to be identified and rectified so that more elderly would seek care for their morbidity. About half of the hypertensives had reported "missing at least one dose of anti-hypertensive drug'. Health workers during home visits should be able to recognize the hypertensive patients and advise them to be compliant to the treatment. The study was carried out in the community and sample was selected by a random method which adds to strengths of the study. Findings of this study cannot be generalized to state or national level since the study sample is confined to a limited geographical area but it offers an insight into the burden of the problem and puts forward the need to introduce mechanism for early diagnosis and management of hypertension in the elderly. Information regarding caffeine intake, alcohol intake, non-steroidal anti-inflammatory medication use, body mass index, and dyslipidemia were not collected and would have given better insight. Estimates of expenditure on treatment for hypertension and adherence to anti-hypertensive medication were based on smaller sample of individuals. This community-based study has showed a high prevalence of hypertension among the elderly in rural South India. Strategies should be identified to diagnose hypertension at an early stage and prevent or postpone its complications in this age group as burden of hypertension is bound to increase due to increasing life expectancy rates. The authors are grateful to Indian Council of Medical Research (ICMR) for awarding the Short-Term Studentship-2011 project to Bharathy Mohan (BM). The authors thank all the elderly people who participated in this study. 1. Census of India 2001. Office of the Registrar General and Census Commissioner of India. Ministry of Home Affairs. Government of India. (Accessed January 20, 2012, at: http://www.censusindia.gov ). 2. Srinath Reddy K, Shah B, Varghese C, Ramadoss A. Responding to the threat of chronic diseases in India. Lancet 2005;366:1744-9. 3. Fuentes R, Ilmaniemi N, Laurikainen E, Tuomilehto J, Nissinen A. Hypertension in developing economies: A review of population-based studies carried out from 1980 to 1998. J Hypertens 2000;18:521-9. 4. National High Blood Pressure Education Program Working Group Report on Hypertension in the Elderly. National High Blood Pressure Education Program Working Group. Hypertension 1994;23:275-85. 5. Hypertension Study Group. Prevalence, awareness, treatment and control of hypertension among the elderly in Bangladesh and India: A multicentre study. Bull World Health Organ 2001;79:490-500. 6. Vokonas PS, Kannel WB, Cupples LA. Epidemiology and risk of hypertension in the elderly: The Framingham Study. J Hypertens Suppl 1988;6:S3-9. 7. Whelton PK. Epidemiology of hypertension. Lancet 1994;344:101-6. 8. Reynolds E, Baron RB. Hypertension in women and the elderly. Some puzzling and some expected findings of treatment studies. Postgrad Med 1996;100:58-63, 67-70. 10. The seventh report of the Joint National Committee on prevention detection evaluation and treatment of high blood pressure. National Institutes of health. (Accessed February 12, 2012, at http://www.nhlbi.nih.gov/guidelines/hypertension/ ). 11. Kalavathy MC, Thankappan KR, Sarma PS, Vasan RS. Prevalence, awareness, treatment and control of hypertension in an elderly community-based sample in Kerala, India. Natl Med J India 2000;13:9-15. 12. Bharati DR, Pal R, Rekha R, Yamuna TV, Kar S, Radjou AN. Ageing in Puducherry, South India: An overview of morbidity profile. J Pharm Bioallied Sci 2011;3:537-42. 13. Hazarika NC, Biswas D, Mahanta J. Hypertension in the elderly population of Assam. J Assoc Physicians India 2003;51:567-73. 14. By Y, Mr NG, Ag U. Prevalence, awareness, treatment, and control of hypertension in rural areas of davanagere. Indian J Community Med 2010;35:138-41. 15. Pratim DP, Bhaswati S, Nilanjan G, Ashique FK, Subhasis C, Arpita D, et al. Hypertension and related morbidity among geriatric population of Eastern India. Mat Soc Med 2012;24:29-33. 16. National Policy on Older Persons 1999. Ministry of Social Justice and Empowerment. Government of India; January 1999. 17. National Policy on Senior Citizens 2011. Ministry of Social Justice and Empowerment. Government of India; March 2011. 18. Operational Guidelines. National Programme for the Health care of the elderly. Directorate General of Health Services Ministry of Health and Family welfare. Government of India;2010-11.